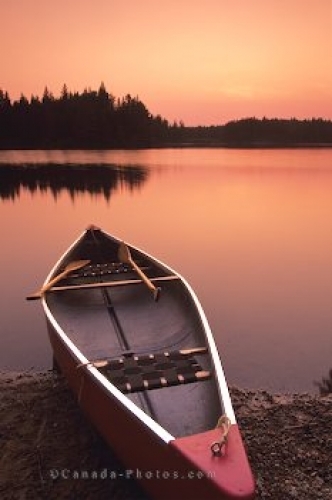 A beached canoe on a lake shore frames a tranquil sunset in Algonquin Provincial Park in Ontario, Canada. There are a huge number of lakes and ponds and thousands of kilometers of places to get full usage out of your canoe in Algonquin Park. A beached canoe near a lake in Algonquin Provincial Park in Ontario, Canada at sunset. Picture of a beached canoe at sunset in Algonquin Provincial Park in Ontario.